Once a year, fans have the opportunity to flock to the races at the Christian County Fair in Taylorville, IL. That time is almost here, as the Ag Fair begins on Tuesday night and the racecars roll into town on Wednesday, July 27. 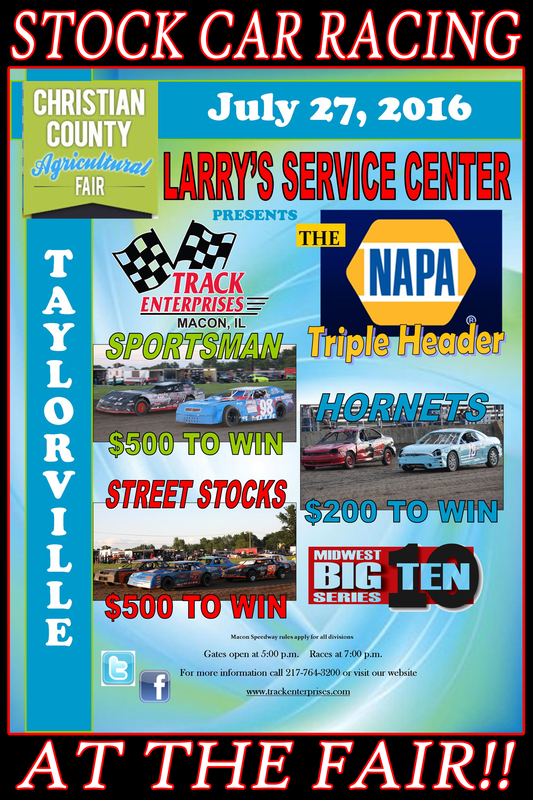 It will be the third annual NAPA Triple Header presented by Larry’s Service Center. UMP Sportsman, Midwest Big Ten UMP Street Stocks, and UMP Hornets are on schedule to thrill fans, young and old. Heading into the event, Decatur, IL driver, Dave Crawley, Jr. leads the standings in the Midwest Big Ten Street Stock division. Crawley, who has had a great season in the Modifieds and Street Stocks, holds a 24 point edge in the Big Ten standings after claiming wins at Lincoln and Macon and finishing second at Jacksonville. Oreana, IL driver, Kyle Waters is second in the points with a best finish of third at Macon in May. Terry Reed, Jeremy Nichols, and John Farris are top five competitors in the standings. $500 and UMP as well as Big Ten points will be on the line. The Sportsman class will be back in action as well. Jeremy Nichols, who put on a great show with Dennis Vandermeersch at Macon this past Saturday, has won each of the Sportsman events in Taylorville the last two years. He will again be the favorite Wednesday night. Plenty of Taylorville, IL locals are expected to be racing in the Sportsman class for the $500 top prize including Tim Bedinger, Brad Bedinger, Jim Bedinger, Scott Landers, and Ty Nation. Rounding out the racing action will be the UMP Hornet class. The Hornet division has seen a bit of a resurgence in 2016, boasting better car counts on a weekly basis this year. Wednesday night’s race should be a good one with a solid field going for the $200 top prize. Jeremy Reed has won both of the Hornet events at the fair. When it comes to Taylorville locals, Ryan Barton and Anthony Elam are among those who local fans may be able to cheer for in the class. Pits open at 4:00 on Wednesday, July 27, grandstands at 5:00, competitor pill draw ends when the drivers meeting begins at 6:00, hotlaps at 6:20, with racing action taking the green at 7:00. Macon Speedway UMP rules will apply for all classes of racing. For more information, visitwww.trackenterprises.com or www.christiancountyfair.com. For further details call 217-764-3200.